A 25-year-old man who is a nursing home resident with a past medical history of cerebral palsy presented to the emergency department with new-onset seizures. He was ventilator and enteral feed dependent and chronically nonverbal. 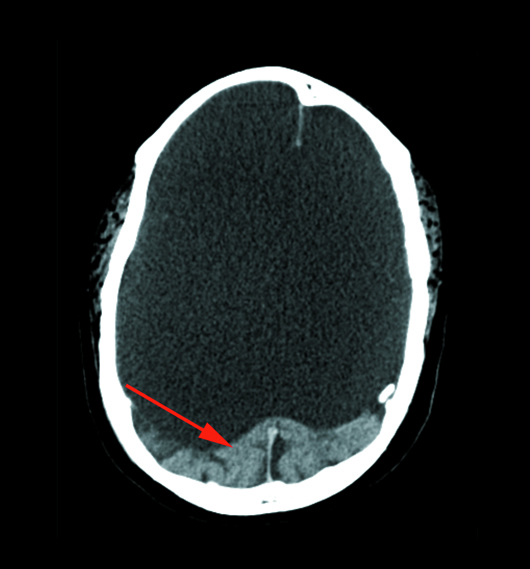 A noncontrast CT head scan was obtained upon admission to evaluate for an intracranial hemorrhage. Helically acquired axial noncontrast CT brain image (Figure 1) demonstrated an absence of the cerebrum with a fluid-filled cranial vault. 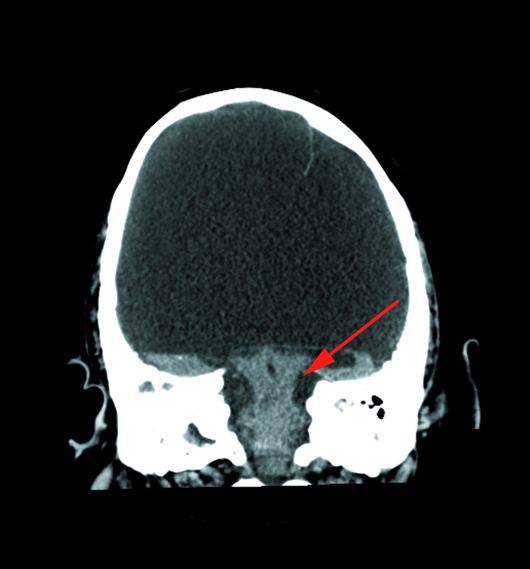 An occipital lobe remnant was seen (red arrow). Coronal CT brain image (Figure 2) through the level of the brainstem demonstrated a brainstem remnant (red arrow). Prognosis for HE is poor; most affected children die before birth. Those who survive do not initially show evident neurological or clinical signs; archaic reflexes, leg, and arm movements are usually present at birth, as are sucking and swallowing reflexes.4 The signs become rapidly more pronounced after a few days, presenting with severe hypotonia, irritability, and seizures. In the children who survive, visual impairment, spastic diplegia, and cognitive delay are expected. — John A. Cieslak, MD, PhD, is a diagnostic radiology resident at Northwestern University. 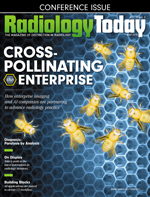 — Elena G. Violari, MD, is a radiology resident at the University of Connecticut. — Clifford Yang, MD, is an associate professor of radiology at the University of Connecticut. 1. Cecchetto G, Milanese L, Giordano R, Viero A, Suma V, Manara R. Looking at the missing brain: hydranencephaly case series and literature review. Pediatr Neurol. 2013;48(2):152-158. 2. Hamby WB, Krauss RF, Beswick WF. Hydranencephaly; clinical diagnosis; presentation of 7 cases. Pediatrics. 1950;6(3):371-383. 3. Lam YH, Tang MH. Serial sonographic features of a fetus with hydranencephaly from 11 weeks to term. Ultrasound Obstet Gynecol. 2000;16(1):77-79. 4. Pavone P, Praticò AD, Vitaliti G, et al. Hydranencephaly: cerebral spinal fluid instead of cerebral mantles. Ital J Pediatr. 2014;40:79. 5. Greco F, Finocchiaro M, Pavone P, Trifiletti RR, Parano E. Hemihydranencephaly: case report and literature review. J Child Neurol. 2001;16(3):218-221. 6. Pavone P, Nigro F, Falsaperla R, et al. Hemihydranencephaly: living with half brain dysfunction. Ital J Pediatr. 2013;39:3. 7. Jordan L, Raymond G, Lin D, Gailloud P. CT angiography in a newborn child with hydranencephaly. J Perinatol. 2004;24(9):565-567. 8. McAbee GN, Chan A, Erde EL. Prolonged survival with hydranencephaly: report of two patients and literature review. Pediatr Neurol. 2000;23(1):80-84. 9. Quek YW, Su PH, Tsao TF, et al. Hydranencephaly associated with interruption of bilateral internal carotid arteries. Pediatr Neonatol. 2008;49(2):43-47. 10. Sepulveda W, Cortes-Yepes H, Wong AE, Dezerega V, Corral E, Malinger G. Prenatal sonography in hydranencephaly: findings during the early stages of disease. J Ultrasound Med. 2012;31(5):799-804.